NEAR AROMAS – Cut back and off haul 150,000 yardsof dirt? 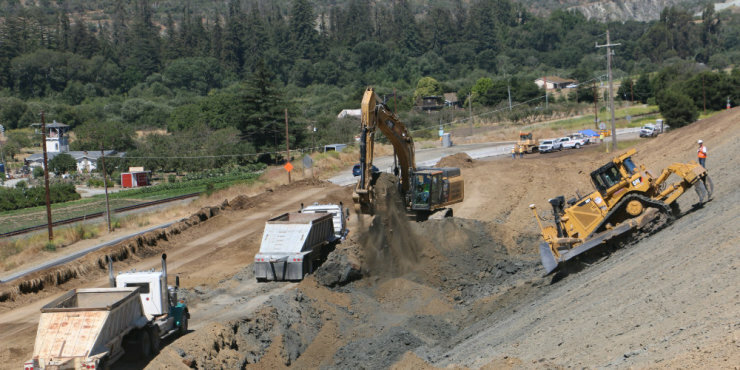 No big deal for Graniterock’s Construction Division, which is in the first stage of a safety improvement project on aportion of Highway 129 between Aromas and Highway 101. 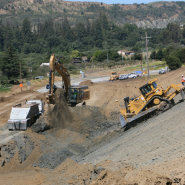 The $4.5 million Caltrans project in Santa Cruz County between Old Chittenden Road and the Chittenden Underpass is designed to lessen the curve and increase sight distance for drivers. In essence, make the two-lane highway safer. The area is known for head-on collisions due to the sharp curve in the road, especially during wet weather. To realign the road, crews are cutting back the slope on the north side of Highway 129. Operator Bob Cados has consistently done a great job in getting the dirt loaded into trucks taking it to a subdivision under development in nearby San Juan Bautista. The bid was won by Estimator Randy Bonino, while Project Manager Spencer Wright oversees the work. Completion, including repaving that section of highway, is expected at the end of 2017. Thanks to everyone working hard to make this a One Company success. Stephen Whitmire, Mike Mowry, Luis Rosales,Joey Martin,Cecil Short,JJ Magallenes Neri andJesus Jimenez.